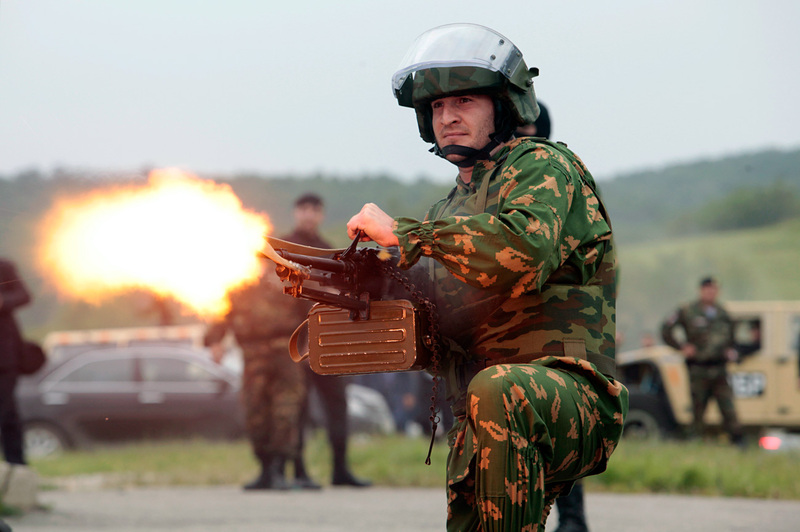 A soldier fires a machine gun as he takes part in a military exercise in the village of Tsentoroi, 80 km (50 miles) southeast of Chechnya's provincial capital Grozny, Russia. Chinese special forces want to be trained in tackling suicide bombers at a private institute in the Chechen city of Gudermes. Moscow is presently studying the proposal. China has requested the Russian government to allow its special forces to be trained in anti-terror measures at a private institute in Chechnya. The Security Council of Russia and the Russian Foreign Ministry are studying the proposal, Daniil Martynov, head of the privately run Chechen International Special Forces Training Center in Gudermes said. He added that the Chinese military approached the center at the Annual Warrior Competition in Jordan, where a Chechen division won first place. In July 2016, a Chinese security services delegation visited the Chechen capital of Grozny. This month a Russian delegation, comprising of representatives of the institute, paid a return visit to the Xinjiang region in Northwest China, which faces a separatist insurgency. According to Martynov, the Chinese are ready to “fly [to Chechnya] tomorrow,” however the training will only be possible when all the security clearances are obtained. The Chechen International Special Forces Training Center in Gudermes is scheduled to run at full capacity in 2018. The facility, which is spread over 400 hectares, will have its own runway and about 40 training facilities for anti-terrorist drills in simulated urban environments. The center will also have a wind tunnel, a training field for mine-explosives and a paratrooper’s complex. The center, which is backed by private investments and gets no government funding, is the brainchild of Chechen leader Ramzan Kadyrov. In November 2016, Kadyrov said he was looking for foreign instructors, including some "tough guys" from the U.S. The center plans to employ 200 people. Ten American instructors have applied to work in the center, Kadyrov said last month.